Dirtball | 100% Enviro Friendly. 100% Made in USA. 100% Badass. Action Sports Clothing. HICKORY, N.C. (May 16, 2011) – Eco-friendly action sports apparel brand Dirtball Fashion announces the creation of the “2 Piece and a Biscuit Tour,” a four-stop regional North and South Carolina skate competition that will award thousands of dollars in cash and prizes in three divisions. North Carolina-based Dirtball developed this concept as a way to highlight the talents of regionally-based skaters as well as to promote the importance of skate parks and environmental awareness in the Carolinas. Contributing to the effort and acting as competition MC will be local legendary skateboarder and Charlotte native Ray Goff. Dirtball Fashion founder and president Joe Fox has a long history in action sports. After decades of racing sports cars, in the NASCAR Nationwide Series and as a racing instructor, Fox spread his entrepreneurial wings to create Hickory, North Carolina-based Dirtball Fashion. Products went on sale in 2008 and the current lineup includes T-shirts, shorts, hats, knits, water proof shells, pants and shirts, all made with 100% recycled content – making Dirtball the “greenest” action sports brand around. For full information, sign up sheets, judging and division information regarding the Dirtball “2 Piece and a Biscuit Tour presented by Monster Energy,” visit www.dirtballfashion.com. For Media Interviews with Joe Fox, President of Dirtball Fashion, or addition information about the company, please contact Dan Passe at 704-634-9022 or dan@passeconsulting.com. [Nashville, TN]—March 28, 2011—How many water bottles does it take to make a t-shirt? What about a pair of board shorts, or a hoodie? The folks at Dirtball Fashion can tell you: 2, 25, and 45. Launched in 2008 by Joe Fox, this eco-friendly start-up has come a long way in a short time and is now venturing into the new frontier of social commerce with the help of Moontoast’s Distrbuted Store. While several specialized retailers carry the Dirtball line, the bulk of sales for the company come through their website and online store. Using Moontoast’s Distributed Store to extend their online reach directly to their Facebook fans was a perfect match for the company’s growth goals. In the “real world,” Dirtball has built alliances with extreme sports venues and athletes by being part of that community at events and in the shared support of environmental causes. Moontoast’s Distributed Store lets them bring that same direct connection to their online fan relationships and build their sales in a way that’s as authentic as their brand. Moontoast is a social commerce company based in Boston and Nashville. Today, our products, which include Facebook commerce, distributed stores, and commerce communities, empower artists, brands and individuals to open the doors to a world of new audience-building and revenue-generating opportunities. For more information, visit us at www.moontoast.com, or check out Moontoast ImpulseTM at www.fanimpulse.com. HICKORY, N.C. (March 12, 2011) – Eco-friendly action sports apparel brand Dirtball Fashion announced today that it will be sponsoring the Le Mans Prototype entries of U.K.-based Woodard Racing for the entire Intercontinental Le Mans Cup beginning with the American Le Mans Series (ALMS) Mobil 1 12hrs of Sebring on Saturday, March 19th. The focus of this program is to use the action-packed, eco-aware world of international sports car racing as a platform for Dirtball Fashions initiative and purpose, to provide the finest eco-friendly action sports apparel to fans worldwide. Dirtball Fashion produces clothing made exclusively from recycled cotton fiber and advanced post-consumer polyester blends derived from recycled water bottles. The connection of Dirtball Fashion founder Joe Fox to the world of sports car racing since his first SCCA racing school in 1990. Fox competed on a variety of arenas, including on the ALMS stage in 2004 with the the Krohn-Barbour Lamborghini team. It was in 2007 when Fox, after decades of racing sports cars, in the NASCAR Nationwide Series and as a racing instructor, spread his entrepreneurial wings to create Hickory, North Carolina-based Dirtball Fashion. Products went on sale in 2008 and the current lineup includes T-shirts, shorts, hats, knits, water proof shells, pants and shirts, all made with 100% recycled content – making Dirtball the “greenest” action sports brand around. Please visit http://www.dirtballfashion.com for more information and an on-line catalog. For Media Interviews with Joe Fox, President of Dirtball Fashion, or addition information about the company, please contact Dan Passe at 704-634-9022 or dan@passeconsulting.com..
Jeff Koons titled the skateboard deck he did for Supreme in 2006 ‘Monkey Train.’ The work is silkscreen on wood. Image courtesy of LiveAuctioneers Archive and Treadway Gallery. CHANDLER, Ariz. (AP) – As long as skateboards have been around, kids have been covering them in stickers and drawing on them with markers. Maybe that’s why a Chandler art show full of skate decks seems to strike a chord with all ages. “People are excited about it. People have fond memories of skateboarding as kids, and it just kind of brings back that childhood joy we’d all like to tap back into,” said Eric Faulhaber, visual arts coordinator at Vision Gallery where patrons dropping by this week have been eager to see the gallery’s next show. Full Deck: A Short History of Skate Art opened last week at Vision. An anthology of skate art from the 1960s to the present, the show includes almost 300 decks borrowed from pro skaters, skateboarding companies and artists across the country. Among the decks, you’ll see the usual skulls, dragons and monsters, but there are also some unexpected faces: Johnny Cash, Sitting Bull, Batman and Hillary Clinton. Elmo, with his arm in a sling, the Tin Man from the Wizard of Oz, and a half-octopus pirate baby coddled by a mermaid mother also make appearances. On other boards, peaceful nature scenes recall vintage national parks posters. Full Deck also includes a display of about 25 early wood and aluminum boards circa 1960 and a 1920s or 1930s-era rudimentary skateboard prototype. Lenders to the show include pro skaters Corey Duffel, Mark Gonzales, Obi Kaufman, John Lucero and Lance Mountain, and Skip Engblom, the Zephyr skate shop co-founder profiled in the movie Lords of Dogtown. The exhibition was curated at the Bedford Gallery at Lesher Center for the Arts in Walnut Creek, Calif. It is traveling to museums, galleries and universities across North America. With a vintage 1980s-era skateboard belonging to Tony Hawk, the Smithsonian National Museum of American History has begun a collection of artifacts focusing on skateboarding and skate culture. Smithsonian press release Tony Hawk donated a 1980s pro model skateboard by Powell-Peralta to the Smithsonian National Museum of American History. Hawk, 42, donated the pro model by Powell-Peralta after skating on it at the Quiksilver All ’80s All Day Vert Jam, held at Surf Expo in Orlando earlier this month. Wearing 80s-era garb, including a flyaway helmet, fluorescent Jams and knee high-socks, Hawk performed inverts, McTwists, and Madonnas. And just like the old days, he won against a field that included some former competitive rivals such as Christian Hosoi, Mike McGill and Kevin Staab. 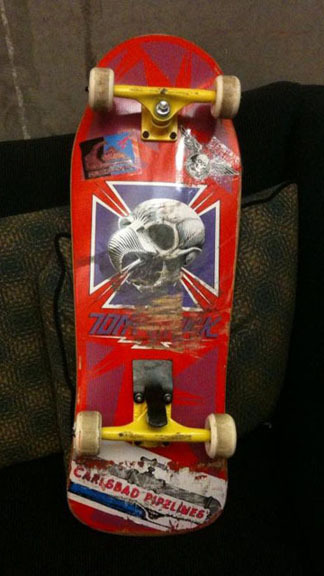 Hawk’s board is the first artifact in a broader collection focusing on skateboarding and skate culture by the museum’s Lemelson Center for the Study of Invention and Innovation, according to spokesperson Kate Wiley. The museum is interested in the material culture of skateboarding, including archival items, equipment, technology, tricks and other paraphernalia such as video games. Wiley said interest in skateboarding grew out of an exhibition from 2009 at the Smithsonian’s National Museum of the American Indian called Ramp It Up: Skateboard Culture in Native America. The Lemelson Center already has a collection dedicated to snowboarding. The graphics on Hawk’s deck feature a familiar image from the 1980s, with the skull of a hawk superimposed on an iron cross. It was designed by Powell’s in-house artist, Vernon Courtland Johnson (VCJ), who helped create the skull and bones imagery common in skateboarding. Hawk’s board will join a 1978 Honeycomb Pool Board donated by Stacy Peralta, and another Powell board in the museum’s permanent sports collection. Wiley said the museum has no plans to display the boards yet. Each Dirtball T-shirt contains 2 ½ 16oz. water bottles. Dirtball’s current short “The Dirt Short” – is made out of 10 16-ounce bottles, which have been repurposed to create a high-quality polyester fabric. The shorts are not only recycled, but recyclable. Once a pair is worn out it can be returned to Dirtball Fashion where it gets sent back to their North Carolina headquarters to be re-spun back into polyester fiber. To thank the customer for their environmental friendliness, the customer will receive 20% off a future on-line purchase. No other clothing company has a recyclable short. All shirts printed with water based ink. 51 billion plastic bottles go into U.S. landfills every year. Buy buying fabric made with recycled cotton, you are helping to reduce the effects of insecticides and other chemicals have on our soil, air and water tables. Cotton uses some 25% of the world’s insecticides, even though it is grown on 2.4% of the world’s land. Cotton consumes 60% of the insecticides applied in the U.S. The majority of the organic cotton is produced in Asia and shipped to the U.S. offsetting any environmental benefits due to the transportation resulting carbon footprint. HICKORY, N.C. (May 26, 2009) – Dirtball Fashion launched it’s “Summer Series” today encompassing 16 new T-shirt designs for men, women and children by Atlanta based graphic artist Shane Poda. Poda, who has done design work for numerous Fortune 500 companies as well as several brands in the skiing and outdoor industry is the first of several designers that will be putting their artistic touch ton the Dirtball brand. “When the folks at Dirtball approached me about doing some designs I couldn’t say no. It is a great brand and what a story, they are doing it right”, stated Poda. Dirtball’s President, Joe Fox stated “I recognized Shane’s artistic ability and insight into the creative process and knew he would be a great asset to our brand and in an effort to continually offer “fresh” products to our customers”. Founded in 2008 by Joe Fox, race car driver, entrepreneur and North Carolina native, Dirtball strives to make fashionable, eco-friendly clothing for active individuals – cutting across age and gender lines. Dirtball only uses recycled or organic domestic produced materials in their products and all products are designed and produced in the United States the majority within a 250 mile radius of headquarters. Not only does the recycled content add to the ecological-friendliness of the company, but the U.S.-based manufacturing arm adds to the local economy and shortens shipping distances, thereby reducing Dirtball Fashion’s carbon footprint. Please visit www.dirtballfashion.com for more information and an on-line catalog.